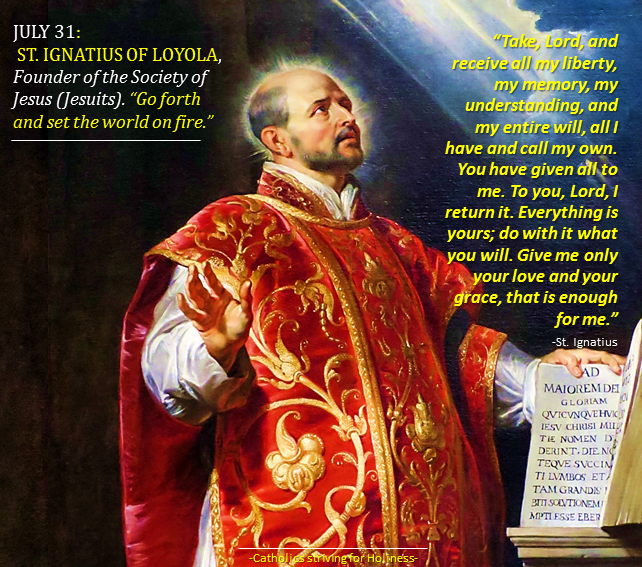 July 31: ST. IGNATIUS OF LOYOLA, Founder of the Society of Jesus. Gratitude to God for All the Good Done by the Jesuits. The Importance of Spiritual Reading. Born as the youngest of 13 children of a noble and wealthy family in Loyola, Spain, and baptized as Iñigo ─which he will later change into Ignatius (1491-1556) in Paris─, he became a soldier although his father wanted him to pursue an ecclesiastical career. He was fascinated by the adventurous lives of his elder brothers who had military careers. Serving his relative, D. Antonio Manrique, Duke of Nájera and vicar of the King of Navarre, he fought against the French defending the Castle of Pamplona until he suffered from a battle wound caused by a cannon fire on May 20, 1521. While he was recovering in Loyola, without any novels of chivalry and military exploits on hand and which he would have preferred to read, he read books on the lives of saints, but above all, on the life of Christ instead. This eventually brought him closer to Christ, the Eternal and Universal King to whom he wanted to render tribute and serve, instead of a temporal king. He underwent a profound conversion and went to a pilgrimage to Jerusalem, spending some days in the Abbey of Montserrat where he changed his lavish stately clothes to those of a poor beggar, and consecrating himself to Our Lady. He also made a general confession and received his first spiritual formation from a Benedictine monk. He spent a year in Manresa, living a life of prayer and penance and doing apostolate and works of mercy in hospitals. In a nearby cave, illumined by God, he wrote his first spiritual experiences, norms and meditations which will later form part of his renowned “Spiritual Exercises”, referred to by Pope Pius XI as the sagest book for directing souls. Upon his return from his pilgrimage to Jerusalem, he was convinced that theological formation is necessary in order to carry out the apostolic tasks which God wanted from him so at 33 years of age, he started learning Latin in Barcelona, transferring later to the universities of Alcala and Salamanca. On February 1528, he went to the University of Paris where he later obtained his doctorate in Philosophy on April 1534 and where he gathered his first followers; Fabio, Xavier, Lainez, Salmerón, Rodrigues, Bobadilla and with them, made vows of apostolate, poverty and chastity. Together with Ignatius, they shall be the future pillars of the Society of Jesus which is dedicated to the greater glory of God and to the service of the Church, in total obedience to the Pope. The Society was approved by Paul III on September 27, 1540 and from then on, has done a great good to the Universal Church throughout these centuries with their apostolic and evangelizing missions all over the world, academic formation of the clergy, founding of numerous universities and schools, social initiatives for the benefit of the poor etc. St. Ignatius died in Rome on July 31, 1556 and was canonized by Pope Gregory XV on 1622. INTO SAINTS throughout these centuries. On this regard, we can propose it to ourselves as a daily act of piety: Why not dedicate at least 10 minutes a day to read a good spiritual book which will nurture our soul? You may ask your spiritual director to recommend you a good book which will ignite your heart towards the path of conversion, holiness and love of God and of all souls, as it did to St. Ignatius! LET US THANK GOD FOR ALL THE GOOD ST. IGNATIUS OF LOYOLA AND HIS SPIRITUAL CHILDREN HAVE DONE TO THE CHURCH AND TO THE SOCIETY ALL OVER THE WORLD THROUGHOUT THESE CENTURIES. LET US THANK ALL THE JESUITS ALL OVER THE WORLD FOR THEIR HEROIC SELF-GIVING, HOLINESS, APOSTOLIC ZEAL AND FIDELITY TO THEIR VOCATION. OBEDIENCE TO THE ROMAN PONTIFF. ALL THE RELIGIOUS CONGREGATIONS AND INSTITUTIONS THROUGHOUT THE WORLD. but the knowledge that I am doing your holy will. -Fr. Rolly Arjonillo, priest of Opus Dei. CATHOLICS STRIVING FOR HOLINESS. We are also in Facebook: www.facebook.com/CatholicsstrivingforHoliness Hope you like our page and invite your friends as well to do so in order to help more people.